Here are some pictures of e-pucks sporting their new spiky hats (click to enlarge). The purpose of these hats is to allow us to mark each e-puck with 3 reflective spheres, as shown on the left e-puck in the pictures. 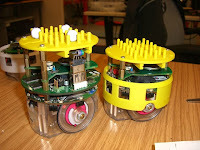 The reflective spheres allow the e-pucks to be tracked by our Vicon tracking system, and the grid of spikes means that we can provide each e-puck with its own unique pattern of 3 reflective spheres. Jan Dyre (who took these photos) tells me that there are 92 ways of uniquely arranging 3 spheres on this 6x4 grid. The Vicon system will, I'm advised, be able to track each robot in the swarm by recognising its unique pattern of 3 spheres. The Vicon system is due to be set up by their engineers this coming Thursday: it will be great to see it working.